Clothes could one day take snaps of everything happening around whoever is wearing them. US researchers have made smart fabric that can detect the wavelength and direction of light falling on it. The research team has found a way to accurately place sensors in each fibre and co-ordinate the electrical signals they send when light falls on them. 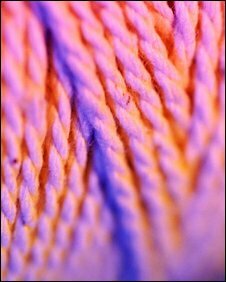 The results were a step towards "ambient light imaging fabrics" said the researchers. Led by Dr Yoel Fink from the Massachusetts Institute of Technology, the researchers have extended earlier work that placed sensors in relatively large polymer fibres. Dr Fink and colleagues found a way to stretch the 25mm strands of polymer into much thinner fibres while maintaining the relative positions of the sensors. This earlier work has led to the creation of very long and flexible light and temperature sensors that may find a role in smart fabrics for soldiers or those working in hostile environments. In their latest work, described in a paper in Nano Letters, these thinner strands were woven into a 0.1m square section of fabric. The careful creation of the fibres and positioning of the light-sensitive elements meant that the team knew which signals were being sent by which sensors. This enabled the team to reconstruct, albeit crudely, an image projected onto the small square of fabric. The researchers said their work was an "important step" towards finding ways to get many nanoscale devices working together.